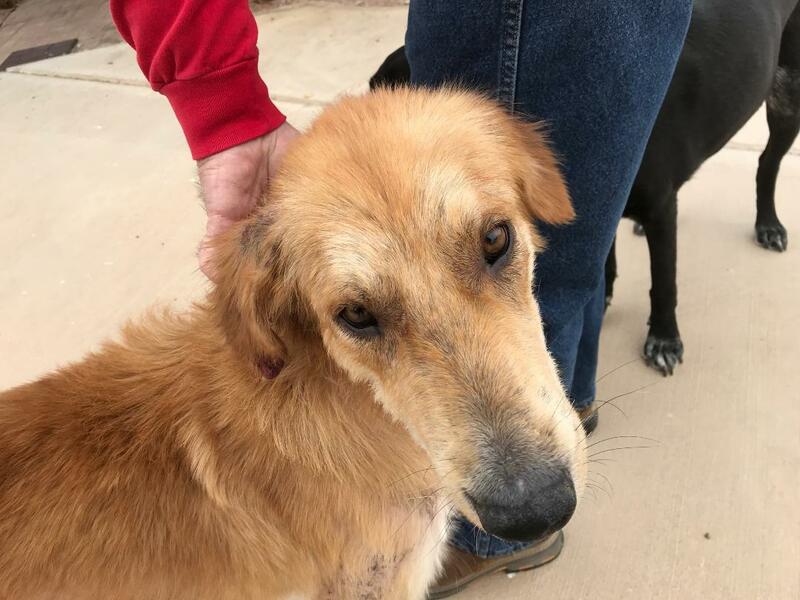 Southern Arizona Golden Retriever Rescue received a call from a group of people who they work with on the Border who knew of a Golden Retriever badly in need of rescue, as he was found wandering on the street and covered in wounds. Of course, Southern Arizona Golden Retriever Rescue said yes. The Border people willingly drove the dog to Tucson and met the Rescue at the veterinarian office. What a pitiful boy the dog was, covered in scabs and emaciated but still willing to give a tail wag to any and all. They called him Bingo. He had lost so much, he needed so much comfort. He was pretty shut down but sweet and accepting of help. The vet gave him a good exam, blood work, a medicated bath and antibiotics. 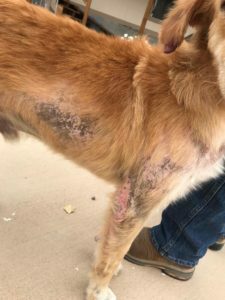 In addition to all the scab covered wounds, he has tick fever, needed a broken tooth pulled, and his coat was thin – almost non-existent. Fortunately, he did not have heart-worm or valley fever and his trust in people and dogs helped him to trust the foster home he went to. Now all Bingo’s wounds are healed and his hair has grown back. He’s been neutered, the tick fever is being treated and amazingly, he acts like a much younger dog now. Bingo knows how to use a doggie door, walks on a leash and the foster care person is working on his manners. Possibly due to starvation, Bingo tends to grab treats rather than take them gently, but he’s learning. Shortly afterward, he went to a forever home where he has another friendly dog to play with. His confidence and coat have returned and he excels in training class. You can meet some golden retrievers and buy bracelets during their Meet & Greets on 11/3 at PetSmart – Oracle/Wetmore from 11 am to 3 pm AND 11/11 at PetSmart – Broadway/Pantano, same time.